The double edge razor blade is perhaps the most iconic blade in terms of shaving history. Beginning in the late 1800’s the shaving with a safety razor, which utilizes the double edge razor blade, became the best way to get a premium shave. Today our double edge razor blades are made of Platinum Stainless Steel and coated to reduce the friction in every shave, cut, or slice. Double edge razor blades are currently used in a variety of industries. Some people still prefer to shave with the traditional safety razor and just switch out the double edge razor blade when one blade dulls. Our 12-356 Double Edge Razor Blade is sold with 10 blades in a dispenser, an excellent choice for personal use. Used blades can be slipped into the back of the dispenser for safe and efficient disposal. In addition to personal use, barbers still commonly use double edge razor blades for shaving. Beauty and barber supply shops stock our double edge razor blades for personal as well as commercial use. Double edge razor blades are also used in bakeries, beginning with the tradition in France of slitting a baguette in a diagonal fashion, called scoring, in order to facilitate the rising of the bread. Used today by bakers of all types, the double edge razor blade used on a baker’s lame, or handle, and is the preferred way to efficiently score bread. Double edge razor blades always come individually wrapped or in dispensers. Blades are flexible and can be snapped in half at the end of the blade’s life. We always encourage safe handling and disposal for all razor blade products. Depending on the quantity and usage you require, we recommend three different double edge razor blade products. Our 12-356 comes 10 blades per dispenser, as mentioned above. Our 17-141 Double Edge Razor Blade offers 250 individually wrapped blades per carton. 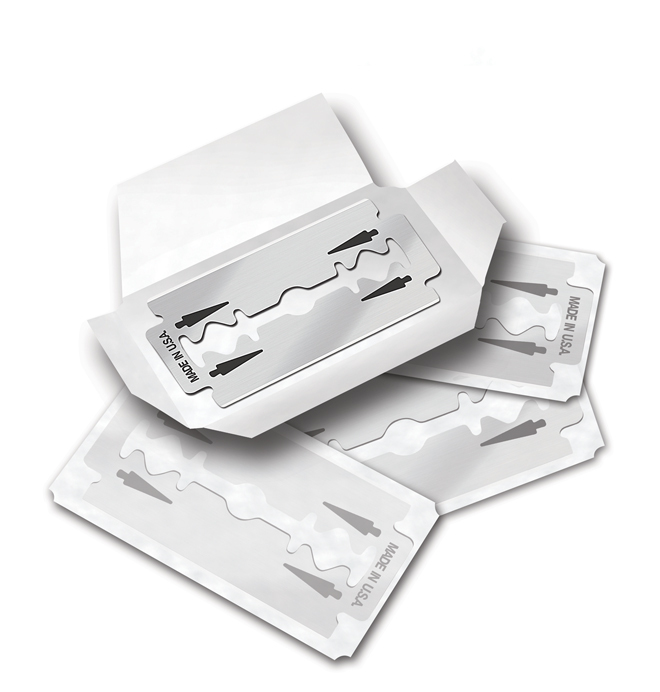 And our 25-044 Israeli made Double Edge Razor Blades offers 100 individually wrapped blades per carton. If you have any questions about our line of double edge razor blades or their suitability for your need, please contact us at (310) 452-1034.